What is Colombia best known for? COFFEE! And while studying abroad in Bogotá, you will discover amazing hidden gems where you can cozy up with a hot cup o’ joe and study, read, or catch up with friends. Each cafe offers a unique experience and its own take on coffee culture. This coffee shop prides itself on teaching its clients everything there is to know about high quality coffee. Come to Amor Perfecto to learn about coffee and take classes in coffee production. This is a chain that can be found all over Bogotá and in other Colombian cities. The coffee is high quality, and there is always a comfy couch to curl up on. Masa was my favorite go-to coffee shop in Bogotá. They have amazing breakfast food and the most complete salad bar in town. They offer dairy-free alternatives to milk and coffee creamer, which isn’t always so common around Bogotá. Masa gets very busy, so it’s not a great place to camp out all day but a good stop for a meal or coffee with friends. Don’t forget an almond croissant on the way out! This indoor/outdoor café based in Chapinero is the perfect spot to spend the day studying. It’s a short walk from the Javeriana University, giving it a strong student vibe. They also let you choose your brewing method, and you can watch the baristas prepare your drink. Varietale offers not only delicious coffee drinks but a wide variety of pastries to go along with them. (Get the carrot cake!) This centrally located café is a hidden oasis in the midst of the city’s hustle and bustle, where you can spend time studying or hanging out with friends in the backyard garden. Azahar is right off of Parque 93, a fancy park filled with restaurants and bars, famous for its weekend pop-up events. Azahar opened in 2017 and has a modern, open-air feel. This is a great place to set up shop for the day and study on one of their big couches, watching the different types of manual coffee brewing they do at the counter. They also serve breakfast and lunch, making this an ideal location in which to spend an extended amount of time. Make sure to bring a sweater! 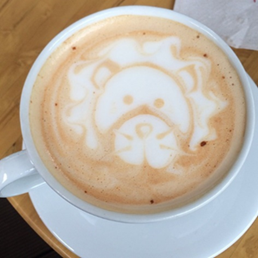 Thanks to Bogotá’s unpredictable weather, the open air café can sometimes get pretty cold! El Altillo is a fun place to stop and take a break on a Sunday or Monday festivo from wandering and exploring the Usaquen flea market. Filled with plants, this café is the perfect spot for relaxing and people watching, especially at one of the tables in the front where they keep the doors wide open. Finally, if all else fails, head over to Juan Valdez, the Colombian Starbucks! Juan Valdez is the coffee chain mascot and an icon for good Colombian coffee worldwide. You can find a Juan Valdez on every street corner. Sarah Becker is the Coordinator - Custom & Faculty-Led Programs.